As our elected officials consider a response to the Newtown massacre, one proposal that is gaining steam is the reintroduction of the Assault Weapons Ban. The legislation, which was originally enacted in 1994, banned the manufacturing and sale of guns like the Bushmaster that Adam Lanza used, along with high-capacity magazines, which Lanza also used. Previous efforts to re-implement the ban since it expired in 2004 have failed, but in a sign that Things Might Finally Be Different This Time, Democratic senator Joe Manchin of West Virginia indicated on Morning Joe today that he would be support the legislation. Joe Manchin is not merely a potential vote for the Assault Weapons Ban. This is arguably the most conservative Democratic senator in the country we’re talking about: a guy who was given an A rating and endorsed by the NRA over his Republican rival in 2010 and 2012; someone who released a campaign ad called “Dead Aim,” in which he promises to “protect our 2nd Amendment rights,” loads a rifle, and shoots a piece of legislation. If Joe Manchin is onboard, then, almost by definition, the Assault Weapons Ban can’t be an attack on the 2nd Amendment. 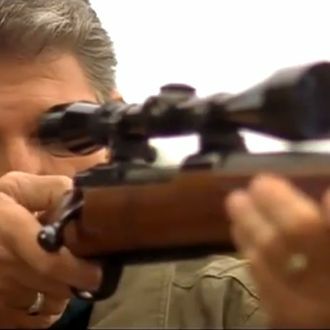 If it were, Manchin would probably shoot it dead.